Bituminous surfaces exposed to varying temperature conditions undergo a great deal of expansion and contraction therefore, an important characteristic of the binder is its ductility and the degree of ductility has an effect on the cracking of bituminous surfaces caused by traffic stress. 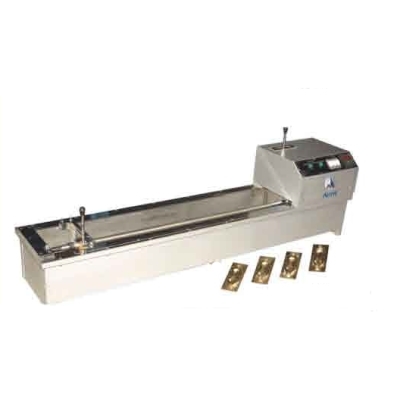 The Ductility Testing Machine is designed to test three specimens simultaneously. The machine consists of a carriage moving over a load screw. An electric motor driven reduction gear unit ensures smooth constant speed and continuous operation. The entire assembly is mounted with water bath completely encased in metal bound hardwood and equipped with an electric pump circulator and heater. Suitable for operation on 220V, 50Hz, Single Phase, AC supply. Ductility Apparatus with cooling arrangement is available on request.